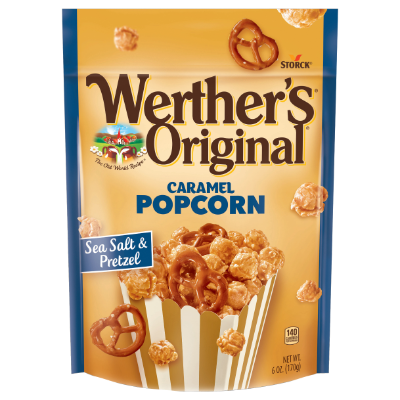 INGREDIENTS: SUGAR, PRETZEL (WHEAT FLOUR, PALM OIL, SALT, MALT EXTRACT (FROM BARLEY), WHEAT STARCH, SODIUM HYDROXIDE, MONO- AND DIGLYCERIDES EMULSIFIER, YEAST), POPCORN, GLUCOSE SYRUP (FROM WHEAT OR CORN), BUTTERFAT, CREAM, WHEY, BUTTER, CONTAINS LESS THAN 2% OF SEA SALT, SUGAR CANE SYRUP, SUNFLOWER OIL, SOY LECITHIN EMULSIFIER, ARTIFICIAL FLAVOR. ALLERGY INFORMATION: CONTAINS WHEAT, MILK, SOY. MAY CONTAIN HAZELNUT, ALMOND, OTHER TREE NUTS, AND SESAME.